Let's start with a confession: I have a weakness for lemonades and sodas of all kinds! I check out every new bottle that hits the shelf and am always keen to try new flavors and the latest on-trend drinks. But there’s another thing that regularly gets in my way: the market is flooded with super sugary sodas. At the merest glimpse of the sugar content of some drinks, the bottle is back on the shelf faster than you can say L-E-M-O-N-A-D-E. So, when I spotted my first bottle of kombucha, everything just…fell into place. Since I’d never tasted a fermented drink before, I didn’t know what to expect, but rest assured, it was love at first sip. And it’s not just me. In the last few years fermented drinks like kefir and kombucha have experienced a real hype. 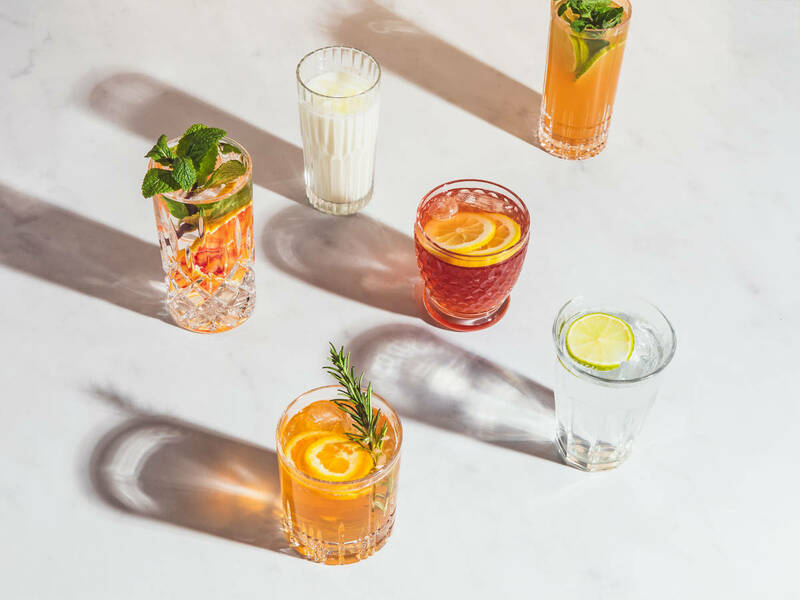 It’s no wonder really, since not only does kombucha make for a delicious drink, but it also has probiotic health benefits, is naturally low- or completely free of sugar, and can easily be brewed up in your very own kitchen—without any fancy equipment. So here’s everything to know about kefir and kombucha—plus our guide to making them at home! Have you ever made kefir or kombucha at home or do you have more questions about fermentation? Tell us in the comments! Fermentation is one of the oldest methods of preserving food, making it more longer-lasting solely through natural processes. It does this by promoting the healthy fungal, bacterial and yeast cultures that exist on almost every foodstuff. Fermenting happens in sealed containers, and in the absence of air, the cultures begin to ‘digest’ the food, transforming carbohydrates into lactic acid and creating an acidic environment. In this environment, harmful germs cannot spread—so food lasts longer while preserving unique flavors and consistencies. Today, we’ll focus on kefir and kombucha, but it’s also worth seeking out and experimenting with their fermented relatives like ‘Hindu’ lemonade, Jun tea, rejuvelac and the beer-like kvass. Kefir: Drink it and live to 100? From "champagne of milk" to the "drink of the centenarians", Kefir has already some extraordinary titles, but what’s behind them? Kefir is a fermented sour milk drink made from cow, sheep or goat milk. Fermentation begins with the addition of a kefir starter culture also known as kefir grains or kefir nodules, which is made up of sugar, yeast, lactic acid bacteria and protein. The lactose contained in the milk ferments, casein (a protein found in dairy products) is broken down and carbon dioxide and lactic acid are produced. After only 24 hours, the original milk becomes an effervescent drink with a slightly sour taste. Kefir can not only be enjoyed pure, but also in smoothies, mocktails or desserts. In addition to its refreshing effect, kefir is mainly drunk for its health benefits. Originally from the Caucasus, the drink spread to Russia at the beginning of the 20th century, where it was prescribed to patients with stomach and intestinal problems—can it just be a coincidence that people in the Caucasus live to an above-average age? What makes kefir so healthy? Kefir has a great nutritional ranking. Because it is made from milk, kefir contains not only calcium, protein and magnesium, but also many B vitamins and vitamin D. As a probiotic drink it supports digestion and the immune system, has positive effects on the intestinal flora and has an antibacterial effect. Those who suffer from an easily irritated stomach or other digestive problems can may benefit from using kefir as a household remedy. With approx. 50 – 60 calories per 100 g / ½ cup, kefir is somewhat lower in calories than whole milk, but the nutritional values depend on the respective starting product: kefir based on low-fat milk has fewer calories overall, while cream kefir with almost 10% fat is the most powerful variant. On that note, that’s one of the key differences between kefir and buttermilk—while both are fermented acidified milk drinks, to make buttermilk lactic acid bacteria are added to skimmed milk. Since lactose is ‘eaten up’ during fermentation, kefir contains only a fraction of it and is therefore more tolerable for people with lactose intolerance—however, this is not a rule of thumb and can vary from individual to individual— so it’s best to trial it for yourself first. If you want to be absolutely sure, you can also produce kefir using coconut milk or even water as a base—more on that later! Kefir is available at the supermarket, but you can easily make it at home. You can find the kefir grains in organic shops or online. Best of all, once purchased, they can be used again and again so you can make new kefir every day. A refreshing, probiotic soda can also be fermented using water as a base, which easily keeps up with the health benefits of milk kefir. Since you cannot buy water kefir, there is no other way than to make it yourself—luckily it’s super simple! You can find the required water kefir crystals, also known as "Japan crystals", online or in organic shops—just like with milk kefir, you can continue to use them and enjoy fresh water kefir again and again. In contrast to conventional sodas, water kefir contains significantly less sugar, because the added sugar is processed into lactic acid, carbonic acid, and vitamins by the yeast and bacteria cultures that are found in the crystals. At the end of the process, only a fraction of it is left in the water kefir. 1. Mix lukewarm mineral water and sugar until the sugar dissolves. Pour the mixture into the glass container. 2. Add kefir crystals, dried fruit and lemon slices. Then close the glass container loosely so that the carbonic acid produced during fermentation can escape. If the lid is too tightly closed, you run the risk that the pressure in the glass becomes too great and your screw-top jar "explodes". 3. Let ferment for at least 24 hours at room temperature (between 20-25 degrees). The longer water kefir is fermented, the more sugar is broken down and the less sweet the finished product tastes. Try your water kefir after 24 hours and let it ferment 1– 2 days longer until you like the taste. Fermentation should not take more than 6 days. 4. Remove dried fruit and lemon slices and pour water kefir through a sieve into glass bottles. 5. Rinse the kefir grains caught in the sieve under cold to lukewarm water, let dry, store, and reuse as needed. The glass container should be washed with hot water before each new fermentation, taking care not to use any harsh detergent that may leave residue and effect the next batch—we recommend using all-purpose white vinegar as your cleaning agent. Important: Do not fill the glass bottles to the brim, but leave some space for the drink to ferment and the carbonic acid to escape. You can now flavor the water kefir with herbs, fruit, fruit tea or the juice of the lemon slices and let it ferment for a second time, making the water kefir even more sparkling. It can be stored in the refrigerator for several weeks, taking care not to seal it too tightly so that the excess carbonic acid can escape. Kombucha: The "elixir of life"
Kombucha is a fermented tea which has been used as a remedy in Asia for centuries and is there knows as the 'elixir of life". Adding the kombucha-culture, known as a “scoby” (Symbiotic Culture of Bacteria and Yeast) to sweetened green, black or herbal tea will activate the fermentation. The innumerable bacteria and fungi in the scoby transform ordinary tea into a probiotic sparkling drink within 1 – 2 weeks. Just like kefir, it is said to have numerous health-promoting effects. Why is kombucha so healthy? As a probiotic drink, kombucha has a positive effect on the metabolism, digestion, the immune system, blood sugar levels and is also anti-inflammatory. Kombucha contains some B an C vitamins and the free-radical fighting antioxidants found naturally in green or black tea. In spite of the impressive list of health-promoting effects, the question of whether kombucha can be made "even healthier" by not usual sugar at all, is always raised. I can tell you the answer is easily—no—because the bacteria and yeast cultures of the scoby consumes the sugar and in turn is able to ferment the drink and support healthy bacteria. This means that the finished kombucha contains only about a third of the added sugar. For those looking to avoid refined sugar, regional sugar beet or cane sugar can also be used. For more experienced kombucha brewers, alternatives such as honey can be tested out. Anyone who’s ever bought kombucha in stores, knows that it can be very expensive—it is so much cheaper to make kombucha at home. As the scoby grows, you can use it again and again, share it with friends, and make kombucha…forever. You can simply order the kombucha scoby online or look for organic markets or health food stores in your area that offer the culture. 2. Pour the tea and sugar into a large glass container and stir. Fill up with the remaining cold water—this way the tea cools down faster. At the end it should be at room temperature, i.e. about 20 – 25°C/ 68 – 77 °F do not add warm tea, otherwise the bacteria in the scoby will be destroyed and the fermentation cannot begin. 3. Add the scoby and the starter tea and cover the glass container with the kitchen towel and seal with the rubber band. 4. Let the kombucha ferment for 7 days at approx. 20 – 23°C/ 68 – 74°F, then try every day until the kombucha tastes good to you. The longer the kombucha ferments, the more sour it tastes. 5. Remove the scoby with clean hands and pour the finished kombucha into glass bottles. Reserve approx. 100 ml/½ cup and use as your next starter and store your scoby in this liquid in a clean glass jar until the next use. 6. You can flavor the bottled kombucha with fruit juice, herbs or spices and let it ferment again for 1 – 2 days at room temperature. This will create even more carbonic acid and the kombucha will be even more “alive”. You can then store it in the refrigerator for several weeks. Since the scoby enlarges and eventually grows a smaller scoby as an underlayer, you can pass them on to friends who also want to make kombucha. Alternatively you can use it in smoothies, as a fish substitute for vegan sushi or even as a face mask.